I was very interested to see the history project to help students learn about WWII. 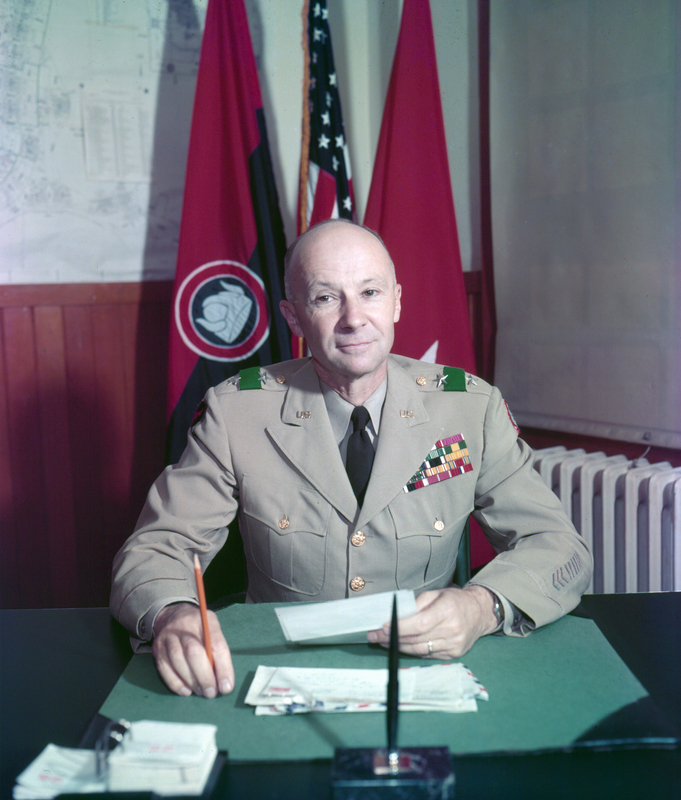 One of the generals your students picked was Major General Myron Cramer, the Judge Advocate General during WWII and the American Judge at the International War Crimes Trials for the Far East after the war. General Cramer was my grandfather. One of the enduring legacies was starting the standards for international war crimes. His work is as relevant today as how we deal with terrorists and war criminals and we still wrestle with how to deal with such individuals. Congress still has work to do in this area. I think this project is a wonderful creative way to teach the next generation the lessons of yesterday. I have served on the staff of two Members of Congress during my career in Washington, D.C. and think your project should be repeated across the country. Merci de votre lettre. Comment allez-vous connexe au le Général ? Il Français d'ithe pour qui le muct de l'Amérique soit reconnaissant. Sans vous, nous n'aurions jamais réalisé notre liberté en 1776. Bravo ! J’ai trouvé ce travail très intéressant, bien fait et émouvant du fait des dessins. La traduction un peu hésitante induit beaucoup de charme et d’émotion. Je tiens à votre disposition des documents ou photos (« sa » Legion of Merit) complémentaires sur le général LEGENTILHOMME. Vive l'Amérique le plus grand pays de la Liberté et de la responsabilité et vive les Américains à qui les Français doivent beaucoup. Ira Leroy Lutes was born on 4 Oct 1890 in Illinois, the son of Ira Leroy Lutes and May Carnahan, not in Massachusetts. He registered for WWI and even it says Illinois with the same birth date as you have. He was my 3rd cousin 3 x's removed. You may research this information on ancestry.com. Once you have done so would you please change your information on his birth for genealogy researchers? I am General Maxwell Murray's great-granddaughter. I would like to correct some information in his biography. He was indeed the son of Sarah Wetmore DeRussy, but Rene DeRussy was Sarah's father, not her husband. She was married to General Arthur Murray, also of the US Army. My grandfather, Arthur Maxwell Murray, was Maxwell Murray's son, and was named for him and his father. Hi - My grandmother's sister, Genevieve, was married to General Menoher. He and my great aunt had two children (both deceased), Pearson and Nancy. Although I never met him, my mother kept a newspaper showing him at the signing of a surrender with the Germans. I still have access to the newspaper (I believe it was the L.A. Times). Is this an ongoing project from Jr. high cohort to cohort or is it now in stasis? Did I send a photo of the actual MG N. E. Hendrickson previously? If not, it is attached. 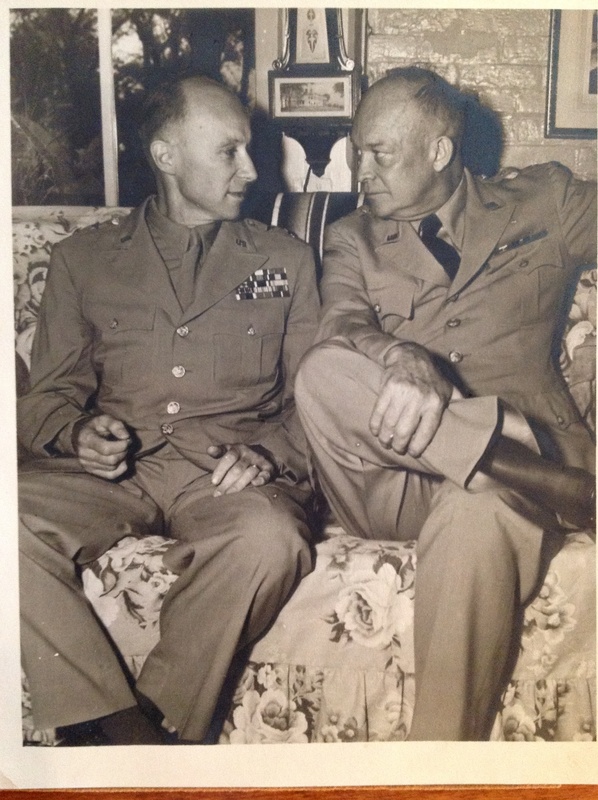 Also, my grandfather was personal friends with General Eisenhower. In doubt? "To General Norman Hendrickson a comrade in arms of WWII. Your best friend Davy D Eisenhower." Davy? Check it our for yourself. 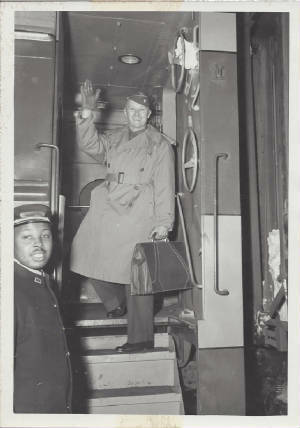 Also, a picture of NEH leaving occupied Japan in 1946. Students are always welcome to contact me for more or to clarify information. >perpetuate the mixing of histories of father and son. One is from the 1950's as a Gen. with the Viking Division flag behind him. The other, Norman is second from the left, is a group shot of the N. African HQ group. i don't know who the the others are. I also have a photo of him with 3-3star and gen. Mark Clark with a handwritten thank you from Gen. Clark. I seems you are just looking for one but if you'd like more just let me know. Also, Gen. Hendrickson was a Col. during WWII. There are 3 Norman E Hendrickson. Gen. Hendrickson would Norman E Hendrickson Sr., my father would be the Jr. and my brother ( a Vietnam vet) the III (3rd). Let me know when the page is updated I'd be happy to see it. Thanks for doing more research and making corrections. I know this isn't meant to be a full biography but just highlights of the service he gave to his country. Nice story but there are a couple of problems... this is a mix of two vets, father and son; my father and grandfather. The picture is of my father. Our family appreciates the effort but a reading of the first paragraph reveals the problem. "Norman E Hendrickson was born January 18, 1925 in Minneapolis, Minnesota. In 1943, a 17-year-old Hendrickson enlisted in the US Navy and served and was sent off to flight school where his love for piloting and engineering flourished, the skills he gained during his training allowed his to serve as an aviation cadet during World War II and the Korean War. 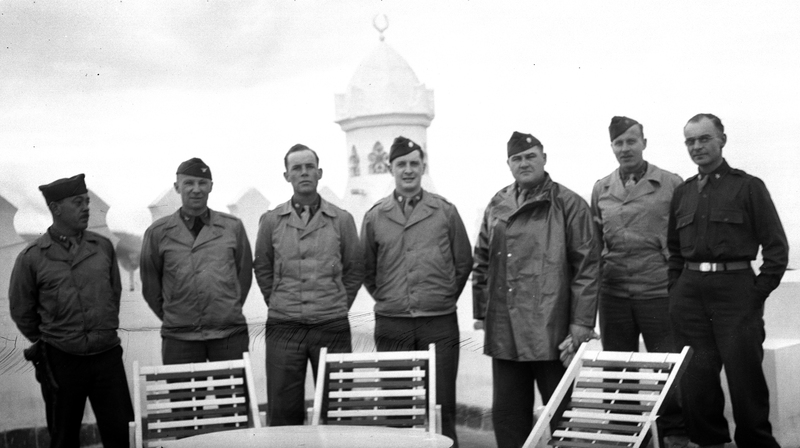 As a Brigadier General, Hendrickson served as Chief of Staff for the 34th Infantry Division during the North African and Italian campaigns. Hendrickson's love for innovation thrived long after his honorable discharge; he continued to share his expertise throughout his life." How does a 17 year old naval cadet suddenly become a general who leads an infantry division during the N African and Italian campaigns? Another factual error: the Mn National Guard 175th field artillery joined the regular 34th division during WWII. After the war Gen Hendrickson was instrumental in forming the MN National Guard's Viking Division aka 47th Infantry about 1946. It remained the Viking division until 1991 when it was decommissioned and the 'Red Bulls' of the 34th Infantry were created. We can provide a picture of Gen Hendrickson, if you'd like. I am very thrilled to know that these students are interested in research and learning about our past. These men and women made us who we are today as a nation. My uncle, brother of my father, was one such a man. Major General Basilio Valdes'. I knew him well. We often visited him at his home in Manila, Philippines. We played with his daughter, Nucay. Like his father he was a doctor if medicine. Many times he would help the less fortunate and didn't charge them. 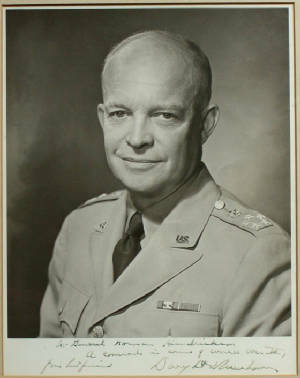 He traveled with MacArthur throughout the WWII. He was the physician of President Manuel L. Quezon of the Philippines. My sister works at The University of Stanford. We have many relatives that live in the Bay Area. I was lucky to have known him as I would spend a lot of time in his home in Manila when I was young. I have a lot of happy and good memories as he would also come to my house and visit us . My cousin sent me the website page that you did for the 'Signatures of War'. General Keyes was our grandfather. My cousin Googled his name and your page came up. I really enjoyed the article that you wrote. You actually had quotes from General Patton that I had never heard before. Our family is very proud of our grandfather and his military history. I don't know if you read that his grandfather was a man named Lucien B. Maxwell. Maxwell was the largest land holder in the country. He was the owner of the 'Maxwell Land Grant' which was over a million acres in northern New Mexico. He sold all of the land and moved to Fort Sumner in the central part of New Mexico. After he died, his son, Pete Maxwell stayed there and his sister was involved with Billy the Kid. Billy was killed in Petes' house. There were quite a number of men, that my grandfather had either served with or his family had been stationed with, that retired in Tucson. They would have small cocktail parties and get togeter. As they got older and there were fewer of them, three or four would come to my grandfathers' house for dinner. Afterwards, they would all sit in the living room and talk. Every so often, one of them would fall asleep in his chair. The others would carry on their conversations. The first one would wake up and join back in. Eventually, another one would doze off. This would go on around the group of men till they had all had a little nap. Then they would all go home. The second movie about Patton titled "The Last Days of Patton" had a character playing my grandfather. Strangely, his last name was 'Maxwell'. The actor looked sort of like my grandfather too. I just wanted you to know that you report was actually read by family members of Gen. Keyes. I will sent the link to my brothers and sisters and some more of my cousins so they can read it too. Thank you for doing such a good job. I came upon information on this project as I was doing a little bit of research on my own, using Google. I had received a letter in 1967 when I was a young National Guardsman away for basic training. It was from a man that I met and chatted with at a USO outside of Fort Jackson, SC. I found out that the man, James C. Dozier, was a retired Lt. General who, more significantly, earned and was awarded the Congressional Medal of Honor. It was such a great honor for me to have met such a humble man. I remember well that at mail-call, the sergeant was understandably taken aback seeing that I, Private Nobody, was receiving mail from a Lt. General. I have saved and treasured that letter all these years. In looking at the project information on your website, I noticed that his name is listed on Page 1; I also saw a "Signatures" page. The reason that I'm contacting you is to see if this is an ongoing project and whether you would want to see a copy of the letter with General Dozier's signature. If you have interest in this letter, please let me know and I'd be happy to share it with you and your students. I thought the following would be of interest to you as his last wife just passed and will be buried in Arlington. Helen Kinney Lutes died Saturday, December 17, 2011. Helen moved to Naples in 1980 from Washington D.C. after the death of her husband, Lt. General Leroy Lutes, U.S. Army. Helen was born April 24, 1912 in Great Falls, MT, the daughter of Professor and Mrs. Edward D. Kinney. She was a graduate of the University of Kansas, with a B.S. degree in Business Administration in 1933. Before her marriage in 1973, she served with the U.S. Government for 34 years, first with the Departments of Army and Defense in Washington, D.C. and then for 13 years overseas in Korea, India, Vietnam, and Columbia with the Agency for International Development, Department of State. Helen served on numerous committees and boards during her time at La Maison and loved the residents and the camaraderie of the community. She always said it was her only real home after leaving Lawrence, Kansas. Helen's Memorial Mass will be held at St. William, 750 Seagate Drive, Naples, January 17, 2012 at 10:00AM. Burial will be at Arlington National Cemetery on April 24, 2012. I would love it if you could include the air warfare article on your page; I'd love to show my professor that I reached out and helped contribute to your page! And I'm sure it would really help other students and teachers too or I wouldn't have reached out. Apologies for the interruption! Hello, Good article on Gen. Cannon. In the last paragraph it would be more correct to say "young airmen" instead of "young soldiers". Would an autographed picture of the General be of any value? Good thing to do and a nice site! Like this, young people in the US are introduced to their country's WW2 history. I recently acquired an A.R. Bolling signed bronze star citation. Might be of interest to your project. Could you du me a favour and send me a digital copy of the signatures pages, as reference material to Bolling's (and other) signatures? It's okay for the student that is currently studying Bollinger to add these pictures to his/her collection and/or the Signatures of War website. And it's okay for him/her to contact me fot additional information/pictures.